That’s the vision being explored by St. Joseph County, which could soon sign off on a $375,000 study to develop a plan for a freight hub near South Bend International Airport with rail access for freight trains. Bill Schalliol, the county’s economic development director, said a pair of international shipping companies — one Asian and the other European — are interested in using the airport here for cargo flights as an alternative to Chicago’s O’Hare Airport. That’s what inspired the plan for the study, which would explore launching the freight hub on roughly 400 acres of property along Lincoln Way West to the southwest of the airfield. The airport owns nearly half of the property but would need to acquire the rest under the plan. It is possible that two mobile home parks and various homes could be bought and torn down. The freight hub also could benefit manufacturers in the New Carlisle industrial area. That is why property taxes collected from businesses in the county’s New Carlisle tax increment finance district would pay for the study. The county plans to hire the Antero Group, a municipal consulting firm with an office in South Bend, to conduct the study over the coming months. The county Redevelopment Commission approved the hiring of the firm earlier this week, and the county Board of Commissioners will consider finalizing the deal in April. The proposed freight hub calls for a network of warehouses and distribution centers that would process international goods. International prospects are looking for alternatives to the Chicago market, Schalliol said, so they can avoid traffic congestion and delays. In South Bend, “they could send products off either by rail or truck and use this distribution center to get to the East Coast or the southern coast,” he said. He said the airport, meanwhile, is well-positioned to launch the freight hub. Its foreign trade zone could be expanded so that shipping companies could unload goods without paying import duties, and its international customs facility would be used to process cargo. Mike Daigle, the airport’s executive director, declined to comment March 15, referring questions to Schalliol. Could rail access be a problem? Right now, Schalliol said, only passenger trains access the airport via the South Shore Line. Freight trains also have access to the line, but they don’t use it to access the airport. That is because there is limited space for rail customers along the line’s current path near the airport. The county has supported a proposal that would solve that problem by rerouting the line so that it takes a more direct route from the west. The line must approach from the west for the freight hub to be developed, Schalliol said, because there isn’t enough land available along the existing route. If the line approaches from the west, he said, it could be used by passenger trains during the day and freight trains at night. The line now passes the airport, heads north along Bendix Drive and doubles back west to its station at the airport. City officials are considering various realignment plans to make the trip shorter, including moving the station to another site altogether. The realignment proposal at the airport would be part of a larger project to double-track 16 miles between Michigan City and Gary — a move that could shave at least an hour from the South Shore ride between South Bend and Chicago. The original South Shore plan called for tearing down about 40 houses in the Ardmore area, on the city’s west side, as part of the proposed rail realignment plan at the airport. The city and county entered into an agreement in which the county would contribute $18 million toward the South Shore double-tracking project between Gary and Michigan City, while the city would spend $25 million on the new route through Ardmore. But protests among Ardmore residents caused the city to rethink that plan last fall. That’s when the city decided to hire an engineering firm to study alternative station sites. Options have included building a station at the Honeywell Aerospace parking lot along existing tracks, expanding the current Amtrak station at Washington and Meade streets, and exploring downtown sites. 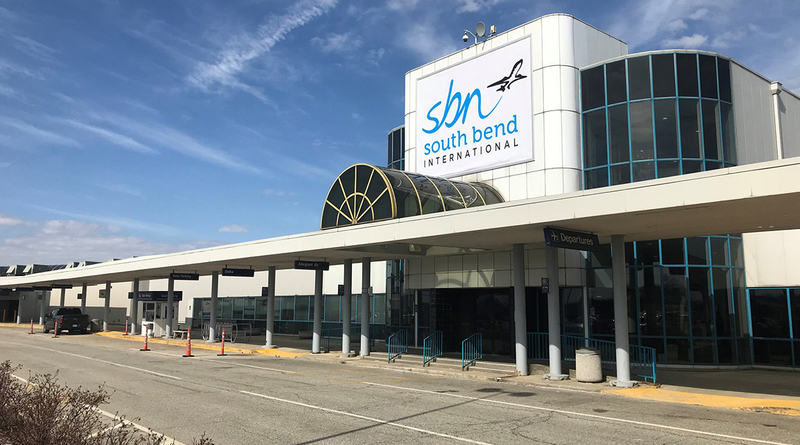 The study also has explored whether a station could be built on property owned by South Bend Chocolate Co. founder Mark Tarner to the southwest of U.S. 20 and the St. Joseph Valley Parkway, commonly known as the U.S. 31 bypass. Tarner plans to build a food production facility and two museums there. County officials are anxiously awaiting the results of the study. If the city decides against the rail realignment plan at the airport, the county would still try to find a way to build a freight-only line that would approach from the airport’s west side.